The rest of the GOP field immediately jumped on Donald Trump on Saturday after he mocked John McCain's war record, the closest thing to an untouchable topic as there is in American politics. There are gaffes, there are big gaffes, and there is what Donald Trump did on Saturday. Whatever you call it — uber-gaffe? Campaign-sinker? — Trump’s comments about Sen. John McCain (R-AZ) on Saturday will go down as a landmark communications case study for what a candidate should not say. Trump committed the mind-numbing unforced error while on-stage with political messaging guru and MDC Partners chief language strategist Frank Luntz at the Iowa Family Leadership Summit. Asked about his feud with McCain, who Luntz described as a "war hero," Trump responded that the Arizona senator "is a war hero because he was captured. I like people who weren’t captured." "Gaffe" doesn’t really describe this. Trump didn’t misstate how many homes he owns or get a world leader’s name wrong; he made an incredibly careless, vicious, and just plain stupid comment in front of a live audience and several TV cameras. If there’s one thing that’s sacrosanct in American politics, it’s John McCain’s war record. As a Navy pilot, he was shot down by the Viet Cong, imprisoned, and tortured for six years. Even in the mean-spirited world of campaign rhetoric, McCain’s military service has almost always been off-limits. 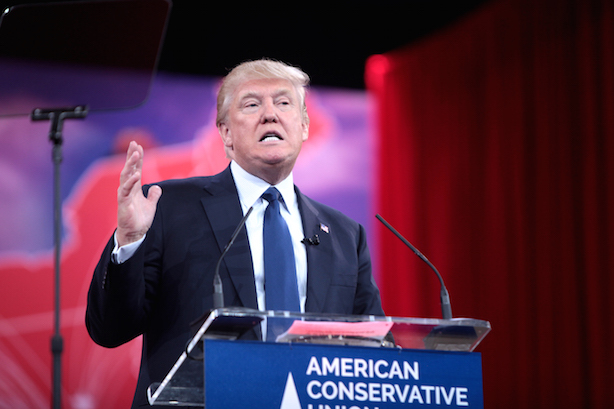 What impact Trump’s comments have on the GOP race will be seen in the polls this coming week. Yet what was immediately clear is that his rivals saw an opportunity to pounce. Trump drew near instant condemnation from nearly every other candidate in the race, as well as Mitt Romney, who has moved nicely into the role of party elder statesman. (McCain, as of this writing, had smartly stayed out of the mess on Twitter). Trump issued a statement on his comments on Saturday. He didn’t double down, but, in his characteristically truculent manner, didn’t apologize either. "I have great respect for all those who serve in our military including those that weren't captured and are also heroes," he said in the statement. The smarter move would have been to apologize post-haste and take responsibility for a momentarily lapse of reason. Though, as you’ve probably noticed, that isn’t exactly Trump’s style. Watch enough cable news, and you’ll hear commentators talk about how Trump isn’t surrounded by aides and minders 24-7 like other candidates. We in the media love that, of course; it results in great copy and sound bites. And drowning out the other candidates on cable news had clearly helped Trump, at least until Saturday. He could use a few aides urging a moment of contrition right about now.